Election results aside, Hillary Clinton's Pantsuit Nation is undeniably alive and thriving, even on the Golden Globes 2017 red carpet. The campaign spirit of last year's most admired woman of 2016 lives on through high-fashion moments at the awards season kick-off. Several celebrities, including a couple Golden Globes nominees, ditched dresses for the arguably more comfortable (but still incredibly chic) jacket-and-pants combos. In the process, the celebs made a political statement—intended or not. Here are some of the celebs who let their outfits say, "I'm with her," at the Golden Globes 2017. First up: Felicity Huffman. The American Crime actress, who was nominated for Best Actress in a Miniseries or TV Movie, showed up to the award show in a sleek, metallic embellished white jumpsuit. In an interview, she openly stated that her look was inspired by HRC. "I got a pantsuit in honor of Hillary," Huffman said on the red carpet. "Love you, Hillary. I'm with her." Huffman wasn't the only celeb to not wear a traditional gown: Westworld'sEvan Rachel Wood kept her awards-show tuxedo streak alive with a custom Altuzarra look. The Best Actress in a TV Drama nominee's outfit also featured none other than an oversized pussybow blouse. And though it may not be a direct homage to HRC, Wood's look was not without inspiration. The actress revealed she was paying tribute to iconic Hollywood suit moments, including those worn by David Bowie. "I love dresses—I'm not trying to protest dresses—but I wanted to make sure that young girls and women know that they aren't a requirement," she told E! 's Ryan Seacrest. "You don't have to wear one of you don't want to, and to just be yourself, because your worth is more than that." 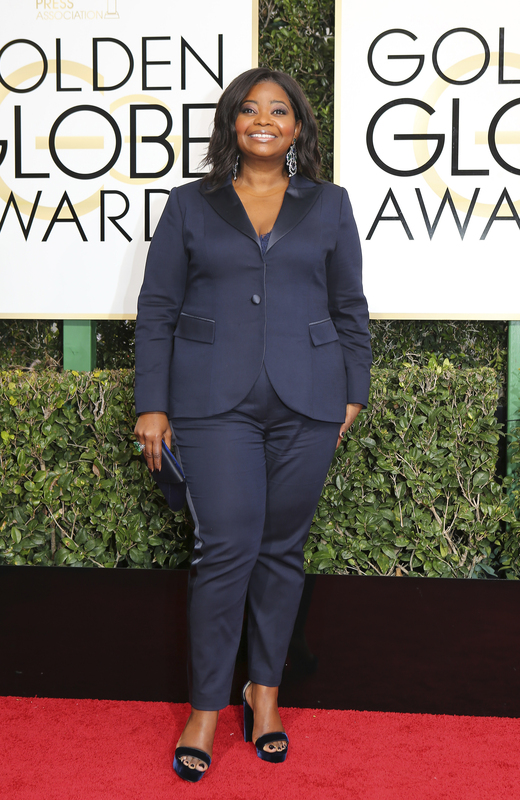 And actress Octavia Spencer, who most recently inspired young women (and men) through her new movie Hidden Figures, which is based on the true story of a group of female mathematicians who were behind getting the first American into space, wore a custom navy Laura Basci tuxedo.